Everywhere you looked Friday night, there were new visuals and new touches. The Grand Canyon University students who produce TEDxGCU all by themselves had done it again. The occasion was the TEDxGCU Preview Event, appropriately in a new venue – GCBC on the second floor of the Student Union. It also had a new emcee. Caleb Duarte, who quickly has made a name for himself with his polished handling of campus events such as Lip Sync, was set up with a desk and sofa styled after “The Tonight Show Starring Jimmy Fallon” and interviewed the TEDx speakers and performers, both in person and in videos. Even the screen behind him displayed “TEDxGCU Preview Event Starring Caleb Duarte” in the same full-moon style as the real thing in New York. Given Duarte’s smooth, chatty demeanor, it felt as if Fallon himself was onstage. It also had what’s known as a graphic recorder. Taryl Hansen, who graduated from GCU in 1990 with a degree in Elementary Education, was set up with an easel next to the stage and commemorated the event with her deft drawings and displays. But the most important thing of all was the location. The goal is to get students excited about attending the Feb. 22 TEDx event in Ethington Theatre, so the preview was brought to the most popular hangout spot on campus to give the target audience a sneak peek. Students can buy tickets for only $5 from 11 a.m. to 1 p.m. Mondays, Wednesdays and Fridays on the Promenade in front of the Student Union. Tickets for GCU employees and the general public are $25-50 and can be purchased here. 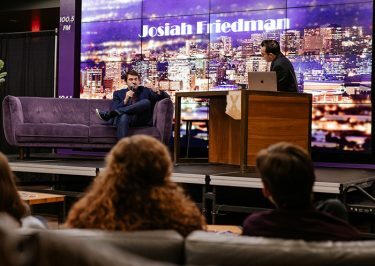 “I really believe the production of this blows the last two years out of the water,” said Dominic Pachuilo, the TEDxGCU president for the second consecutive year. “It was a whole team effort. We have our Monday night meeting from 5 to 8 p.m. every week, and this year we were trying to figure out how we were going to make this year’s preview that different. Two things came to mind. “First, get the students involved. The past two years it’s been off campus, and students haven’t really been involved with it – it was more of a VIP/sponsor type event. We wanted to change that because that’s what we’re about – students. The addition of Hansen added a nice touch. 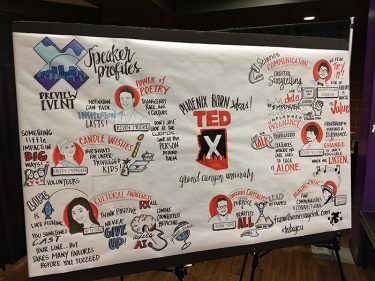 Graphic recording is a specialized field, and it’s easy to see why – and why it’s so valued. Watching her build an event into a work of art is mesmerizing. Hansen was a third- and fourth-grade teacher for most of her life, but over time she saw how visuals helped some students learn. “I decided it was a shame that it was stuck in elementary classrooms when there are so many adults who could be learning through the same method,” she said. When she saw it more and more at adult events and decided to pursue it as a career, the demand became so frequent that she quit her full-time job and now is a worldwide traveler thanks to her business, Frame the Message Ink. Her task requires great listening and art skills, but here’s the funny thing about it – her mom, Carolyn Miller, used to tell her that she was lousy in both areas. Mom was right … at the time. 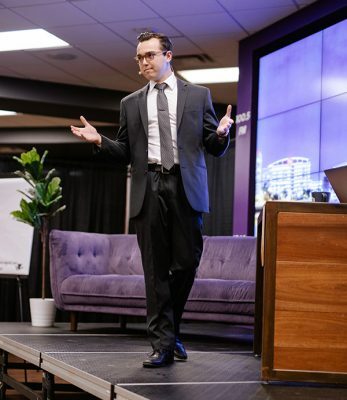 “The kinesthetic action of actually drawing out ideas helped me remember, and it helped me listen differently,” Hansen said. “I was a kid who I didn’t think would do very well in school because I would lose track of what people were saying four or five minutes into it whereas when I drew, it allowed me to put the ideas on paper and hold onto them in much more significant ways. 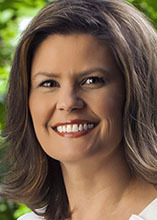 Hansen isn’t able to be in Ethington on Feb. 22 — she’ll be on a work trip to India and Brussels – but at least Duarte will serve as emcee. 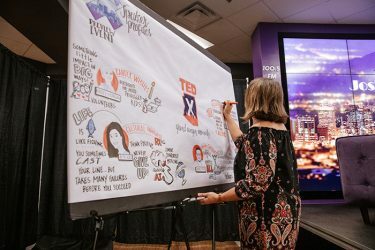 And there will be plenty of other fresh touches for the GCU’s third annual TEDx event, one of the many independently managed conferences authorized by TED (Technology, Entertainment and Design), a nonprofit with a mission to spread ideas. The most notable: The talks will be shorter. Last year, the limit was 18 minutes. This year, it’s 10. That’s in keeping with the mark of a good TEDx talk – short and to the point. The TEDx Village outside Ethington will feature interactive art exhibits, thanks to a partnership with the Phoenix Art Museum. Overall, the audience will notice the students’ continually growing savvy in putting on such a huge undertaking. “We’re trying to really up the production value of the event,” Pachuilo said. Pachuilo was one of 500 people at a “TEDfest” in New York City in 2017 – that’s a required event to become a licensee. 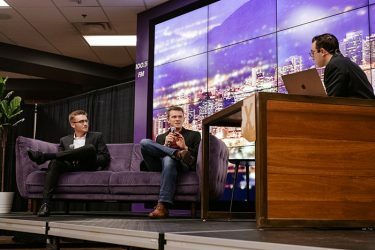 McLean is poised to take over as president for the 2020 TEDxGCU, and he met the licensee requirement by going to a TED event in Palm Springs, Calif., last summer. It’s an experience that will pay off far down the road. That’s because they’re always learning something new. Kristy Morgan, CandleWishes: Spreads love and hope in community by celebrating the birthdays of underprivileged children. 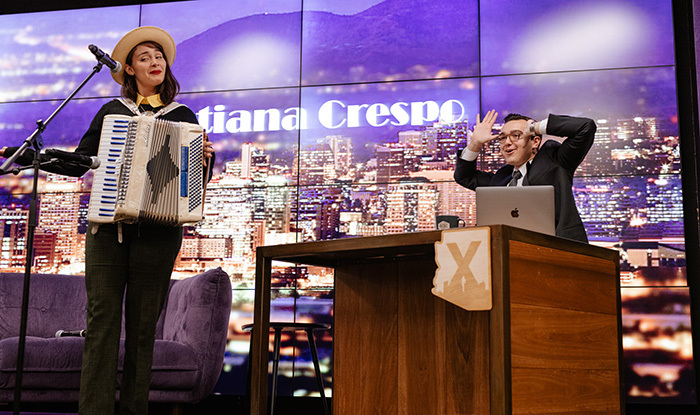 Tatiana Crespo: Singer/songwriter who plays the accordion. Kevin Jacob: Entrepreneur, creative professional and a messenger for growth. Amy Kao, Co-Founder and CMO of RxAll: Working to stop counterfeit medicines in Africa, Southeast Asia and Latin America.